Ten days ago, I made a list of 10 things to do differently for 10 days as part of the 33 disciplines from The Infinite Self. The days have passed and it's time for a check-in. 1. Habit: Leaving many windows and documents open on my computer. I can't bear to close them in case I never find it again!! New Behaviour: Have a maximum of three things open on the computer at any one time. This has been a tough habit to break, but right now I've got five windows open - this one (Blogger), a flute music MP3 which is playing, flute sheet music, gmail and IS9 on the Foodsafety site, which I'll need today. This is significant improvement, and I intend to stick with it. After all, it's only possible to work adequately on one thing at a time. It's also been easier to shut down the computer at the end of the day. This is surely better for the planet than observing that it will take 15 minutes to bookmark, save and close everything and deciding to just leave the thing on overnight. 2. Habit: Piling things up on my bedside table until it's a constant effort to stop the pile falling over. 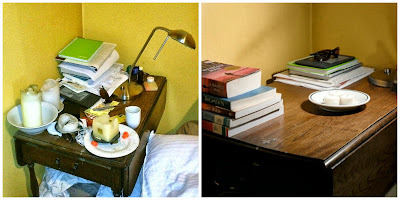 New Behaviour: Keep the bedside table free of clutter. Better. As reading in bed is perhaps my favourite thing, there will always be diverse reading materials close at hand. I have replaced the nasty wax candles with non-toxic soy ones. The sunglasses are my blue-blockers. I wear them when I'm reading, and it helps my brain get ready for sleep. 3. Habit: Whining. New Behaviour: Go 48 hours without making a single complaint or negative/judgemental statement (no whining). Didn't manage it. Maybe I need to lower the bar. Start with 15 minutes? It did shock me how difficult this is, and how often my conversations with people are a whinefest. Isn't anyone happy anymore? Needs work. 4. Habit: Same coffee shop. New Behaviour: Go to a different coffee shop every time I go out for coffee. Achieved and enjoyed it. I checked out the new C1 and Fava. This process was made a lot easier by my usual coffee shop becoming practically inaccessible due to earthquake repairs. 5. Habit: Talking about myself. New Behaviour: Listen, ask people about themselves. Getting there... people are interesting! I struggle with how to do this and not seem like I'm interrogating with a list of questions or getting too personal: "so, where are you from, what do you do for a job? Are you married? do you have kids? what are your hobbies? do you play an instrument? What's a nice person like you doing in this crazy place? I like your shoes, where did you get them?". Two: Dune (ick) and Christian Dior Dolce Vita (niiice!). 7. Habit: Same Spotify playlist every evening. New Behaviour: Listen only to music I've not heard before. Discovered: Yothu Yindi. I also tried just listening to the Spotify top 100, or randomly selecting an album from 'just added', but this often made me want to put tape over my ears. I fell back on searching 'classical' or 'flute duets' and fulfilled my obligation that way. 8. Habit: Never making time for craftwork, putting if off. 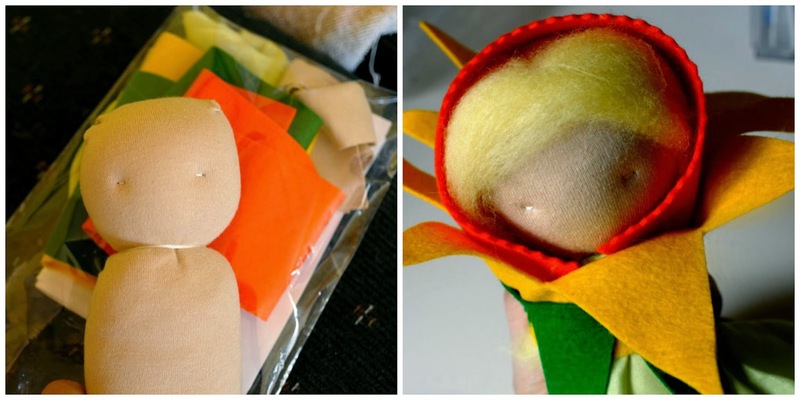 New behaviour: Attend a craft workshop (I've booked in for a dollmaking workshop.. hahahahaha, oh man, I hope I can pull this off). My dolly is a work-in-progress. It's going to be a daffodil marionette puppet, can you tell? Attending a storytelling and dollmaking workshop was the best part of this 10 day shake-up because it attacked my comfort zone in many ways (people I don't know, will they like me?! OMG I can't sew! I don't even have the time for this! ), and that was the main point of the 10 day exercise. The class was such a good time, sitting around with a bunch of awesome women, talking and hand sewing. It was one of those 'yes, I've been missing this in my life' experiences. I also went to a 'Chakradance' workshop yesterday. To be honest, although the facilitator was lovely, I didn't connect with Chakradance at all, and won't be continuing with it (Nia has my heart). However, at the end of the class we drew a Mandala, and that was fun. I thought mine was quite ok, until realising that my vortexes resemble '666'. Demonic mandala was not the goal. It's swirling energy! You can see that, right? Tell me I'm not the anti-christ. 9. Habit: Down the river, around the health centre. New Behaviour: Take a different route on my daily walk. Done! Nothing much to report, except that I had to think harder about where to walk and how long it would take. Other parts around here are just as cool, but not as quiet, so I'll probably return to my regular path. 10. Habit: Must be Plugged In. New Behaviour: Have two technology-free days. Complete fail. Will try again while on holiday in a few weeks. Overall, this was a worthwhile exercise, and something I'll repeat soon, with different challenges. Next time I'll make the list shorter; ten things was a few too many. I think five would be about right. Thanks for your comments on the 23 and Me post. I guess I'm not the only one that likes to go all Sherlock Holmes on my own chromosomes! Yothu Yindi are cool. I have a classical music suggestion - check out anything by the Grigoryan brothers (or Slava Grigoryan). Lovely classical guitar - some tangos, some amazing arrangements of non-guitar music (Tchaikovsky's The Seasons is their new CD) and some original stuff too. Rob's a huge fan...we saw them perform last night for the umpteenth time.